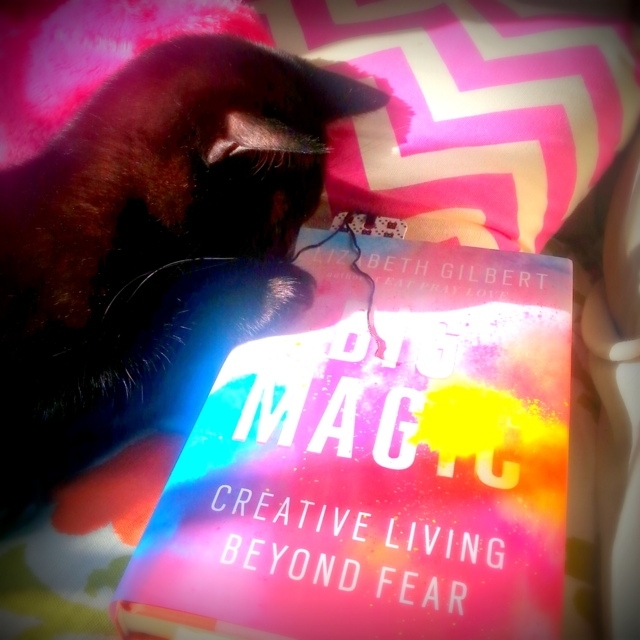 I just finished reading the book “Big Magic (Creative Living Beyond Fear)” by Elizabeth Gilbert. Actually I should say, “we” just finished reading it because I read almost the whole thing with my anti-muse (aka my inner critic) parked like a little devil on my shoulder, heckling it. My anti-muse hated this book on sight but I didn't recognize this at first. I just remember feeling really excited when I heard about "Big Magic" and then all of a sudden feeling oddly resistant to it. I went from, “I should pre-order this.” to “I'll just put it on hold at the library.” to “Maybe I'll wait for the reviews”. When I did read the early reviews, I latched on to the most cynical among them. “Maybe this book isn't for me.” I concluded. It arrived on Sunday. I read the first few pages and was immediately engaged but it felt too heavy somehow. I had other things to do. Did I really want to get into all of this right now? No. I put it down. I put it down but the next day my sunny corner beckoned me and the book was already there so I bravely picked it up again. That's when the cynical voice in my head started to get really nasty: Are you kidding me? This is a joke, right? This chick is out there! Who does this woman think she is? Finally, I realized that these weren't my thoughts. They were too familiar and too frightened for me to not recognize them for what they were. Only she didn't shut up. She was on a serious mission to discredit Elizabeth Gilbert and every word written in “Big Magic”, working every angle from cynicism to nastiness to feigned indifference. And she was outwitted at every turn. This book had an answer for all of my anti-muse's gimmicks and tricks. I actually started to feel a little sorry for her. This stuff was really freaking her out and of course her fears were my fears. But it was all going to be okay, I told us and Liz told us and by the time I finished the book, about five minutes ago, we were both transformed. My anti-muse was no longer my enemy on some imagined battlefield of creativity but a small, wounded creature that needed my care and attention. And I have officially decided that I am no longer a slave to my muse or my anti-muse. I'm just a girl who likes to make stuff. And that is Big Magic.